Great Bento Ideas: Christmas bentos! March the 3rd was Hinamatsuri, or Girl's Day in Japan. (You can read about Hinamatsuri in my Japan Times article.) 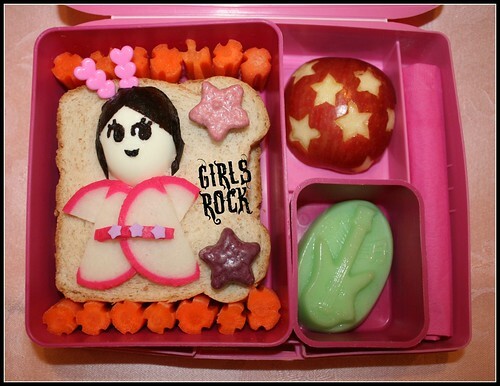 Since this is a day to celebrate girls, there were some very cute and girly themed decorative bentos made. Here are just a few that caught my eye. 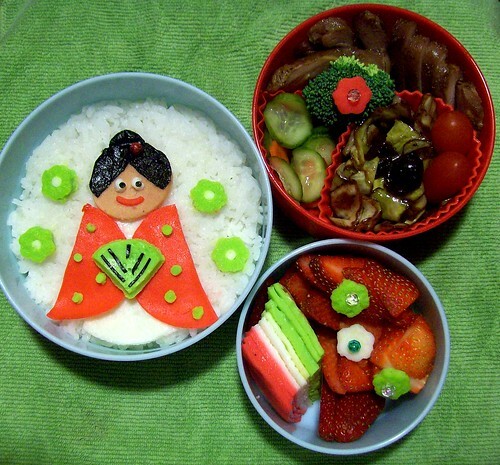 Lia of Bentolicious is the queen of cut-out work, and her Hinamatsuri bento is no exception. Look at the neat precision of those cute little decorations, cut out of colored cooked egg sheets or omelettes (usuyakitamago how-to here) The bases are chicken fried rice. Read all about it on her blog. This little lady by My Lunch Is Cuter also uses colored egg sheets. I don't think the creator has a bento blog (she didn't link to one) but that is a great name for one (hint hint) She does indeed have a blog, right here! Also check out her creations on her flickr photo stream. 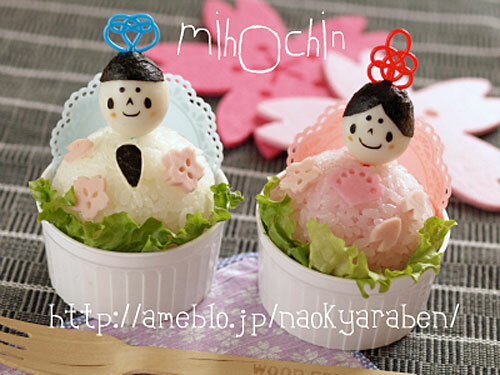 Mihochin-san of the Japanese bento blog Nao-chan no kyaraben to kyara-suweetsu (Nao's charaben and chara-sweets) has been featured on these pages before. (I don't think she has a book out yet, unlike several other Japanese charabentoists. She should have one for sure.) I love her Hinamatsuri idea of using quail's eggs for the heads with decorative picks as hair decorations. Here are her hina doll 'cupcakes' - the cake part is actually mixed sushi (gomoku-zushi). Maybe not the most portable thing, but for a very special lunch at home maybe? Here are the quail egg hina dolls in a more portable pose, on top of chirashizushi (scattered sushi). She says that this was her husband's bento. What a lucky husband! Check out her bento blog here - again it is all in Japanese, but she has tons of pictures to inspire and amaze you. And here's another use of picks as hair accessories, in a sandwich bento by ABQ Bento Mama. The use of simple kamaboko slices for the kimono is inspired! Check out her Flickr photo stream for more bentos and other food creations. 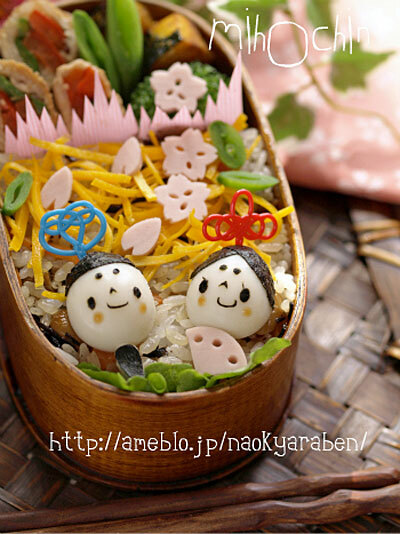 Lastly, this is not a Hinamatsuri bento, but very girly nonetheless so I've included it here. I love it when people see shapes in nature that can be used in their edible creations. 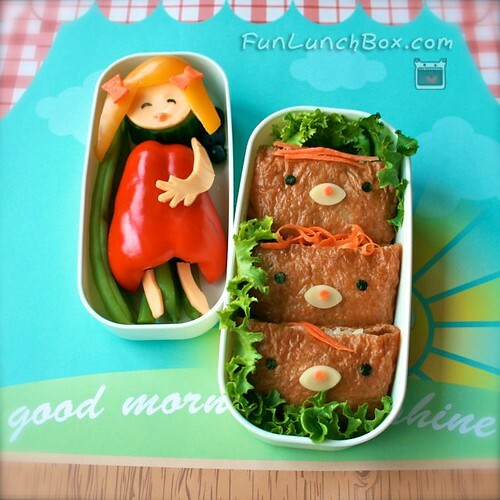 The little Goldilocks in this bento by funlunchbox has a red bell pepper dress and yellow bell pepper hair. And of course there are the three inarizushi bears in the other part of the box too. Adorable! Check out more easy and fun bento ideas on the Fun Lunchbox blog. 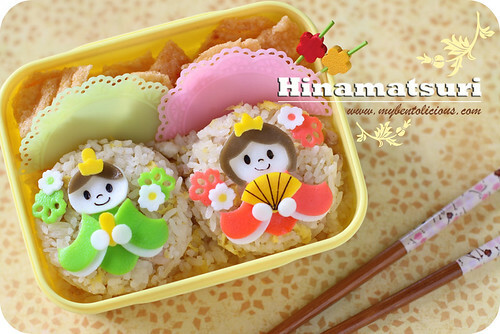 See more great bento ideas from around the bento blog community! These are all very inspiring ~ I especially love the simplicity of using quail eggs and the versatility of using egg sheets and nori. Thank you so much for adding my bento to this post. It's means alot. When I first starting looking in Bento'ing I found you and now it's taken over my life. And yes I do have a blog. Here is the link for any that would like to look. Wed, 2011-03-09 03:31 by anon. The bentos are so lovely!!! Could you share with us by showing us pictures of the moulds that can be used to cut those cute shapes and where we can get them?